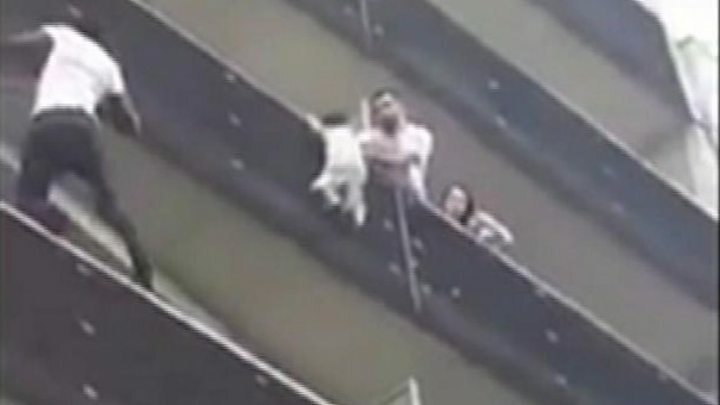 A Malian migrant, hailed as a hero after mounting a daring rescue to save a small boy dangling from a balcony in Paris, is to be made a French citizen. Mr Gassama is said to have arrived in France last year, taking the long and dangerous journey to Europe via a boat over the Mediterranean to Italy. The drama that thrust him to fame unfolded on Saturday evening on a street in the north of the city. He told Mr Macron: "I just didn't have time to think, I ran across the road to go and save him. "I just climbed up and thank God, God helped me. The more I climbed the more I had the courage to climb up higher, that's it," he added. He said that the boy was crying when he hauled him to safety and had also suffered an injured foot. Firefighters arrived to find the child had already been rescued. "Luckily, there was someone who was physically fit and who had the courage to go and get the child," a spokesperson said. Local authorities quoted by French media said the boy's parents were not at home at the time. Paris Mayor Anne Hidalgo was among those to praise the 22-year-old's heroism and said she had called him to thank him. She referred to him as the "Spiderman of the 18th", referring to the Paris district where the rescue took place, calling him an "example for all citizens". Mr Gassama's four-storey dash is a reminder of another Malian hero who gained national prominence in January 2015 during an extremist attack on a Jewish supermarket in Paris. Two weeks later - after six years of struggling to secure legal residency in France - Mr Bathily was given a medal and a French passport by then President François Hollande. In 2016, he wrote a book ''Je ne suis pas un heros'' (I am no hero) and created a charity whose first project was to provide irrigation for his home village in western Mali. Like Mr Bathily's selfless leadership to save the hostages, Mr Gassama's heroic climb to save the boy cements the image of Mali as a country with a culture of old-fashioned public spiritedness.